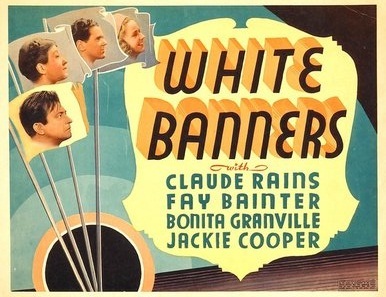 Four days before the June 22, 1938, official release in New York City of the movie White Banners, Warner Brothers came up with the strange idea of staging a "World Première" in a Midwest township of 3800 souls, of whom only 291 were prepared to fork out the 75¢ price of admission to the 5pm screening (many others of the worthy denizens of Columbia City, Indiana, such as 76-year-old David Homer Buffenbarger, left below, were content to wait for a later showing, at 30¢ a ticket). 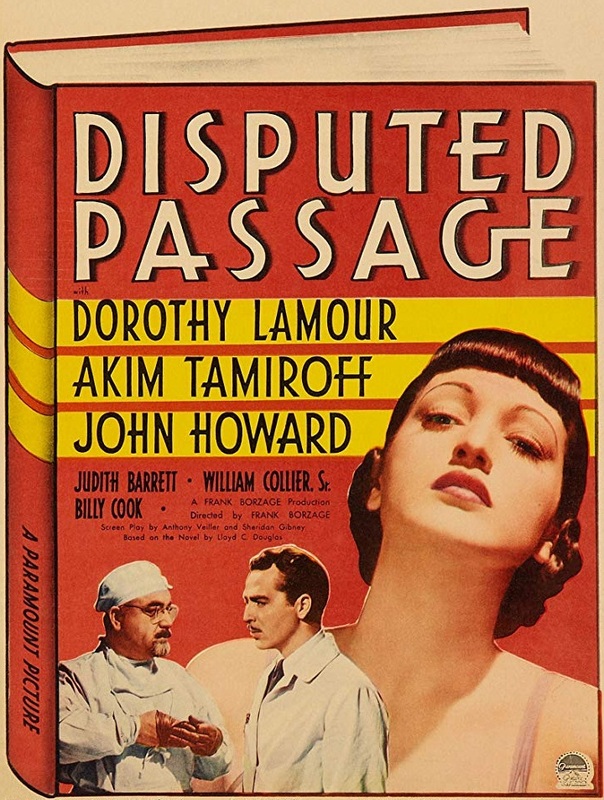 But those who did pay full fare got to hear Lloyd Cassel Douglas, author of the 1936 novel upon which the movie was based, talk about what inspired his book, set in a small town in Indiana just like Columbia City. Douglas was born in Columbia City on August 27, 1877, the son of a Grace Lutheran clergyman. after the "World Première" of White Banners. Warner Brothers sent Douglas back from Bel-Air, California, to his home town, along with a pesky studio publicity team and a pushy newsreel cameraman, in an over-the-top attempt to promote the movie. Columbia City folk were not in the least bit impressed, and complained bitterly about being asked to take part in "fake news" pictures and what they called "hick" set-ups - such as the town's confectioner pretending to have slept for 32 hours outside the theatre in order to be at the head of the queue. Nevertheless, LIFE thought the event sufficiently newsworthy - at least for its own quirky needs - to send Swedish-born photographer Torkel Korling (1903-1998) 140 miles south-east from Barrington outside Chicago to shoot a spread for the magazine's Fourth of July edition. And, in all fairness, Columbia City had decided to mark the occasion by declaring "Lloyd Douglas Day". 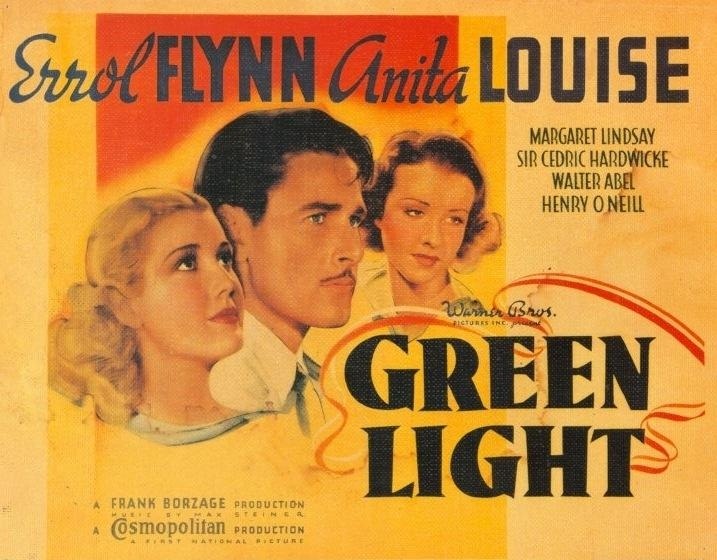 Thus it turned on a good show, from bunting to brass bands, society ladies in their finest and 15¢ "White Banner Sundaes". Douglas was greeted by boy scouts holding white banners when he swung off the eastbound Manhattan limited at Columbia City's Pennsylvania Grounds depot at 1.12pm. He was then swept around town seated on the back of a limousine to the house he was born in, at the west side of North Main Street, which was guarded by scouts. 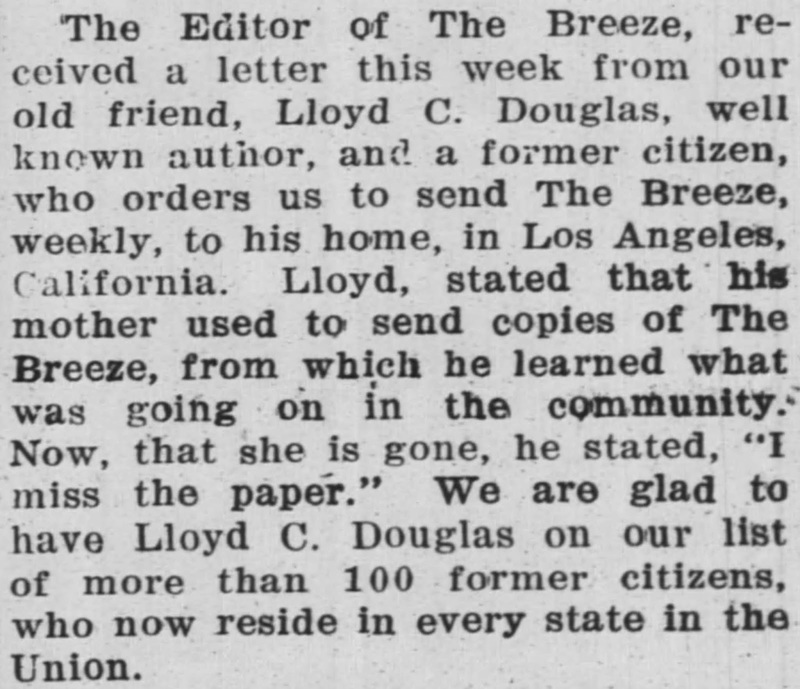 And there were other highlights for Douglas, too, such as the chance to catch up with his 90-year-old mother, Sarah Jane "Jennie" Cassel Douglas (1847–1939), who was living in Monroeville, on the other side of Fort Wayne, and was still contributing a weekly column to the Monroeville Breeze newspaper. Her articles dealt with the customs and events which she recalled from her long lifetime. Jennie died the following April 9, six months short of 92. By that time her surviving son had become one of the world's most widely-read novelists. 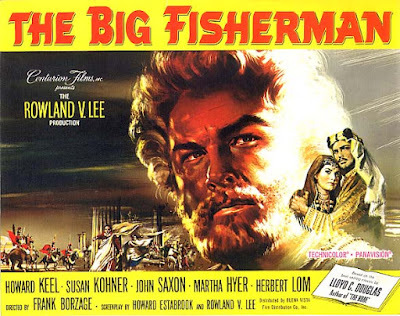 Lloyd Douglas' writings - combining Biblical lore, adventure and love - were read by millions throughout the world and brought him a far greater audience than he ever reached as a minister. Magnificent Obsession and The Robe were his best known works, but others also made into movies were White Banners, Green Light (starring Tasmanian Errol Flynn), Disputed Passage and The Big Fisherman. 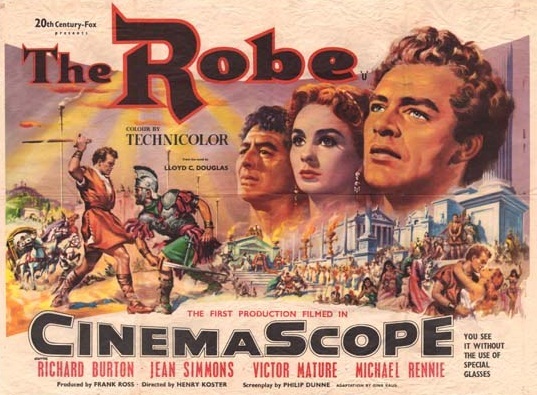 The Robe, the film rights to which were sold for $100,000 to Twentieth Century Fox just after Douglas died in February 1951, was the first film released in the widescreen process CinemaScope, shot with Henri Chrétien's original Hypergonar anamorphic lenses. This development led to Fox screenwriter Nunnally Johnson famously saying he'd have to turn his paper sideways on his typewriter platen. Lloyd Douglas, like his father, became a Lutheran clergyman. He was ordained in 1903 and the next year married Bessie Io Porch, like him the offspring of a Grace Lutheran church minister. Douglas received his doctor of divinity degree from Fargo, North Dakota, College in 1920. He served in pastorates in Indiana, Ohio, Washington DC, Michigan, California and Montreal. He started writing fiction in 1927 and in 1933 retired from the pulpit to concentrate on writing and lecturing. 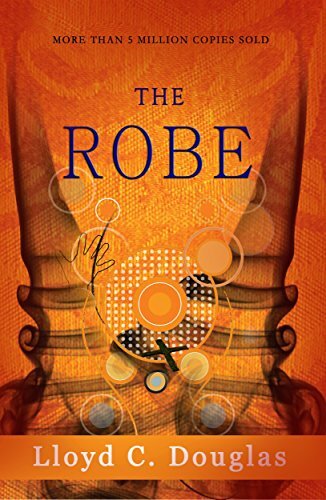 While working on a book of essays designed to apply Biblican rules to everyday life, he decided they would be more interesting and effective in novel form. "It occurred to me," he said at the time, "that the good purpose I wanted to describe would reach more people in story form." 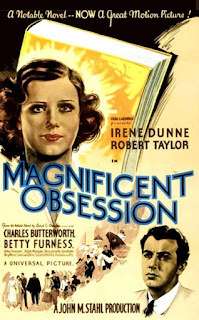 The result was Magnificent Obsession, the first of a series of 11 successful novels. The book was inspired by the true story of Detroit-born Edgar Adolph Khan (1900-1985), the son of the architect of the modern assembly line factory who became a famous neurosurgeon and pioneer in the use of craniotomy for the removal of subdural hemotomas in infancy. Lloyd Douglas' favourite story was how he came to write The Robe (1942). A woman in Canton, Ohio, wrote to him and asked if he had ever heard the legend of the Roman soldier who won Christ's robe in a dice game after the crucifixion. "It set me to thinking," Douglas said, "and I decided to do a little story about it." The "little story" became a book 700 pages long. It entered The New York Times Best Seller list in October 1942, rose to No 1 a month later, and held the position for nearly a year. 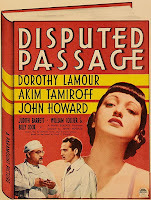 It remained on the list for another two years and returned on a number of reprints. 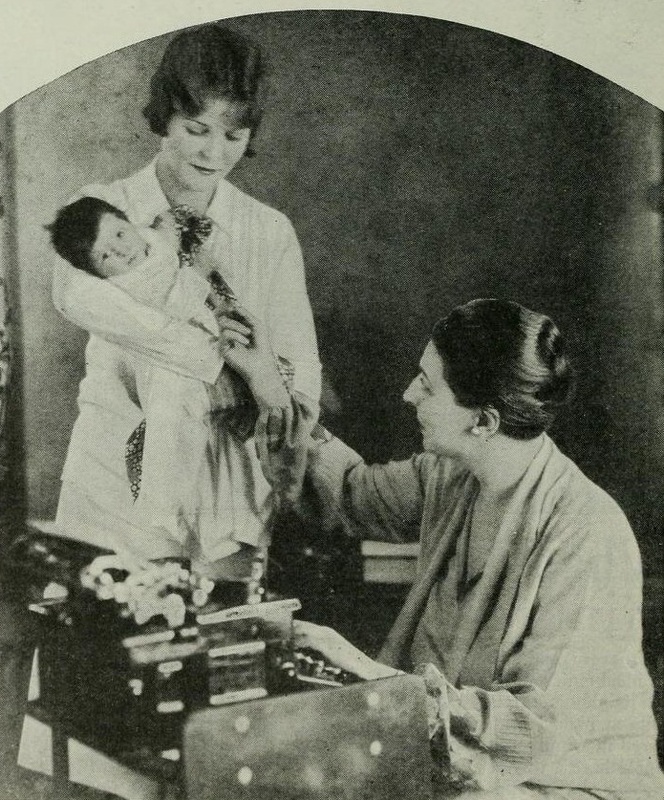 One of the writers for the screenplay for White Banners, by the way, was Lenore Jackson Coffee (1896-1984), below right, a liberated lady who sometimes worked from home so that she could be close to her young children. Joni Mitchell wrote a song about the heroine of White Banners, called Hana, for her 2007 album Shine. 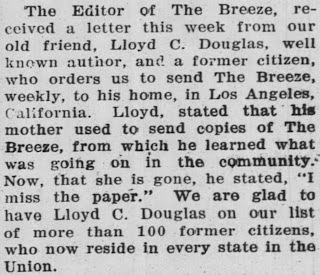 Lloyd Douglas died of a heart attack at the Good Samaritan Hospital in Beverly Hills, California, on February 13, 1951, aged 73.